Aleksandr Isayevich Solzhenitsyn (Алекса́ндр Иса́евич Солжени́цын) (December 11, 1918 - August 3, 2008) was a Russian novelist, dramatist, and historian. He was responsible for thrusting awareness of the Gulag on the non-Soviet world, especially after the publication of his novella One Day in the Life of Ivan Denisovich by Novy Mir in 1962. He was perhaps best-known for his three-volume The Gulag Archipelago. These works made him a cause célèbre and literary giant in the West. He was awarded the Nobel Prize in Literature in 1970 and was then deported from the Soviet Union in 1974. He lived much of his exile in Vermont until he returned to Russia in 1994 after his citizenship was restored. Solzhenitsyn's significance in helping to strip away the legitimacy of the Soviet regime should not be underestimated. It is a long tradition in Russia that the poet can say what the politician cannot. His Ivan Denisovich and later writings about the gulag system did as much as anyone to expose the brutal and repressive nature of Stalin's regime, and, despite efforts at reform, those regimes that would follow. Born in Kislovodsk, Russia, Solzhenitsyn fought in the Red Army during World War II. He became a captain before he was arrested in 1945 for "ASA" or anti-Soviet agitation, criticizing Joseph Stalin in letters to his brother-in-law. He was imprisoned for eight years, from 1945-1953, under the Article 58 law. He spent some time at hard manual work in labor camps of the Gulag. His experience in the gulag system became the basis for much of his literary works, especially his three volume indictment of the penal camp system, The Gulag Archipelago. Then he spent time in a sharashka, a white-collar prison labor compound. He wrote about this in The First Circle. He returned to European Russia in 1956, working as a teacher and writing in his spare time. After Stalin died, Khrushchev set about on a course of de-Stalinization. Ilya Ehrenburg wrote a short novel entitled The Thaw. This title came to stand for a period of Russian literature and cultural life beyond the repressive policies of Stalin. However, the zenith of this period was reached with the publication of One Day in the Life of Ivan Denisovich in 1962 in Novy Mir. Khrushchev approved the publication personally, although he would later regret the decision. The short novel tells the story of Ivan Denisovich serving time in a prison camp for the crime of surrendering to the enemy, even though he escaped and returned to his unit. The real subject of the story is the "one day," the monotonous, brutal daily routine of the prison camp. It is a cruel existence in the Siberian winter without sufficient nourishment, both physical and spiritual. Most of the prisoners are guilty of nothing but being in the wrong place at the wrong time. The temptation is great to give in, to steal or inform or in some way compromise principles to get ahead in the evil system. But Denisovich, a peasant, has the strength and nobility not to compromise. He works and acts with dignity. The story exposes the prison camp and the regime that produced it as an evil perpetrated on good people. The publication of this short novel caused a tremendous stir both inside Russia and in the West. In Russia, it caused a flood of prison camp literature to rise to the surface. Many authors tried to have their memoirs published. The flood of memoirs seeking publication caused Khrushchev to regret having allowed Solzhenitsyn's work to be published. He had intended to publish only one story about the camps as a means of addressing the problem and releasing the pressure, but it had the effect of encouraging many others, an unintended consequence. In the West, it shook the foundations of the Communist Party and intelligentsia, especially in France. While most Western communist parties had already begun the process of de-Stalinization and to distance themselves from Moscow, the French communists were still denying the horrors of Stalin's Russia as bourgeois propaganda. But when Solzhenitsyn's work was published in the official Soviet journal, Novy Mir, (New World) it was like a thunderclap struck in French communist circles. His next few novels, including Cancer Ward were published as samizdat (“self-published”) literature, or pubished abroad. His monumental history of the massive Soviet concentration camps for both criminal and political prisoners won him great acclaim. No longer was this an issue for anti-communists only—all Western democracies had to confront it. The Soviets, for their part, pointed out that the camps of the Gulag had been gradually closed down during the 1950s and the Gulag itself had been abolished by MVD Order 20 of January 25, 1960. Solzhenitsyn became something of a cause célèbre in the West, earning him the enmity of the Soviet regime. He could have emigrated, but always expressed the desire to stay in his fatherland and work for change from within. However, on February 13, 1974, Solzhenitsyn was deported from the Soviet Union to West Germany and stripped of his Soviet citizenship. The KGB had found the manuscript for the first part of The Gulag Archipelago. Less than a week later, the Soviets carried out reprisals against Yevgeny Yevtushenko for his support of Solzhenitsyn. After a time in Switzerland, Solzhenitsyn was given accommodation by Stanford University to "facilitate [your] work, and to accommodate you and your family." He stayed on the eleventh floor of the Hoover Tower, part of the Hoover Institution, finally moving to Cavendish, Vermont in 1976. Over the next 18 years, spent mostly in rural seclusion, Solzhenitsyn completed his historical cycle of the Russian Revolution of 1917, The Red Wheel, and several shorter works. In 1990, his Soviet citizenship was restored, and in 1994, after the demise of the Soviet Union, he returned to Russia. Despite an enthusiastic welcome on his first arrival in America, followed by respect for his privacy, he had never been comfortable outside his homeland. However radical he might have been in the USSR, outside that context he appeared to some to be a reactionary, particularly in his Russian nationalism and his religious orthodoxy. While he had become famous for his criticism of the Soviet Union, he gave a commencement address at Harvard University in 1978 which was very critical of Western culture and morality. In it he attacked Western decadence, arguing that the Russian spirit had been strengthened through its persecution at the hands of the communists, while the Western spirit had been weakened by its materialist excesses and secularism. After this speech, for some, he earned the reputation as being something of an eccentric. Solzhenitsyn returned to his homeland in 1994. While many hailed his triumphant return, after a short time he came to be regarded as something of an anachronism. 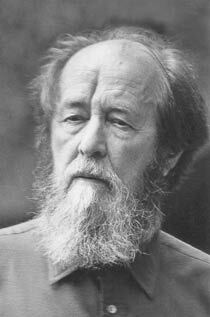 In May 1997, Solzhenitsyn was elected a full member (academician) of the Russian Academy of Science. In 1997, he established his own prize in literature ($25,000). Solzhenitsyn met with Russian Federation President Boris Yeltsin in 1994 and his successor, Vladimir Putin, in 2000. He met Putin again in 2002. On June 5, 2007 President Putin signed a decree conferring on Solzhenitsyn the State Prize of the Russian Federation for his humanitarian work. Putin personally visited the writer at his home on June 12, 2007 to present him with the award. Solzhenitsyn had been criticized by some who considered him a racist and anti-Semite; according to their claims, he frequently made connections between the activities of Jews, Georgians, and Latvians and the causes of the mishaps that befell Russia in the twentieth century. Solzhenitsyn's two-volume book, 200 Years Together (partially based on his 1968 manuscript “Jews in the USSR and in the Future Russia,” in which he used expressions such as "Lenin-Jewish revolution" is considered by many to be anti-Semitic. Several books and series of articles have been written to refute particular claims made by Solzhenitsyn in his work . Solzhenitsyn died of heart failure near Moscow on August 3, 2008, at the age of 89. The most complete 30-volume edition of Solzhenitsyn’s collected works is soon to be published in Russia. [I]n death and after, his miraculous achievements far outshadowed his understandable human limitations: Alexander Solzhenitsyn defied, survived and helped bury a monstrous system of tyranny that claimed even more lives than the Nazi Germany of Adolf Hitler. His work and testimony stripped the last remaining rose-colored spectacles regarding the Soviet system from the eyes of Western leftists and other sympathizers. He consciously saw himself as the latest descendant and heir in the great line of Russian literary and moral titans. And he proved to be a living example of the power of literature and moral dissent. He proved the truth of his conviction that "One Word of Truth Can Change the Whole World," and that, contrary to the most fundamental dictates of the Marxist-Leninist secular faith, the efforts of a single individual really do matter and can indeed transform the world for the better. Alexander Solzhenitsyn, like Fyodor Dostoevsky and Leo Tolstoy, combined the gifts of a novelist with the stature and ambitions of a prophet. He may not have matched their achievements as a writer of imaginative prose, but he was their equal when it came to insight into evil and its collective manifestation…. [W]e must surely recognise, not merely the courage and integrity of the man, but also the truth of his message to our times. If there are evil systems, he is telling us, it is because there are evil people, evil intentions, and evil states of mind. The best we can achieve through amending the system of government is to ensure that mistakes can be corrected and evil condemned. But we should not deceive ourselves into believing that the solution to the problem of evil is a political solution, that it can be arrived at without spiritual discipline and without a change of life…. It is only when we recognise that "the line separating good and evil is drawn through the human heart" that we will have finally understood the lesson of the 20th century..
August 1914 (1971). The beginning of a history of the birth of the USSR in a historical novel, the novel centers on the disastrous loss in the Battle of Tannenberg in August 1914. Other works, similarly titled, follow the story. The Gulag Archipelago (three volumes) (1973-1978), not a memoir, but a history of the entire process of developing and administering a police state in the Soviet Union. Two Hundred Years Together on Russian-Jewish relations since 1772, aroused ambiguous public response. His ex-wife Nastasya Reshetovskaya wrote a book about her life with Alexander Solzhenitsyn. ↑ Martin Seiff, UPI staff, "Solzhenitsyn's achievement in exposing communism" August 4, 2008, UPI.com. Retrieved September 11, 2008. ↑ Roger Scruton, "Alexander Solzhenitsyn: the line within." opendemocracy.net. Retrieved September 10, 2008. ↑ Nick Paton Walsh, January 25, 2003, Solzhenitsyn breaks last taboo of the revolution Nobel laureate under fire for new book on the role of Jews in Soviet-era repression. , The Guardian, UK.Retrieved September 11, 2008. ↑ Russian Jews charge Solzhenitsyn with altering history ,Jewish News Weekly, online Retrieved September 11, 2008. ↑ Interview with Solzhentisyn about "200 Years Together", Lydia Chukovskaya. Moscow News, January 1-7, 2003, . Retrieved September 11, 2008. Biography, Alexandr Solzhenitsyn, nobelprize.org. Retrieved September 11, 2008. This page was last modified on 3 March 2016, at 17:19.